In 2013, Christian Pile, then a pupil of Mae’s Under-12, was the second most outstanding performer at the National Grade Six Assessment [NGSA]. Today he will be named the country’s top performer at the level of the Caribbean Secondary Education Certificate examination [CSEC]. 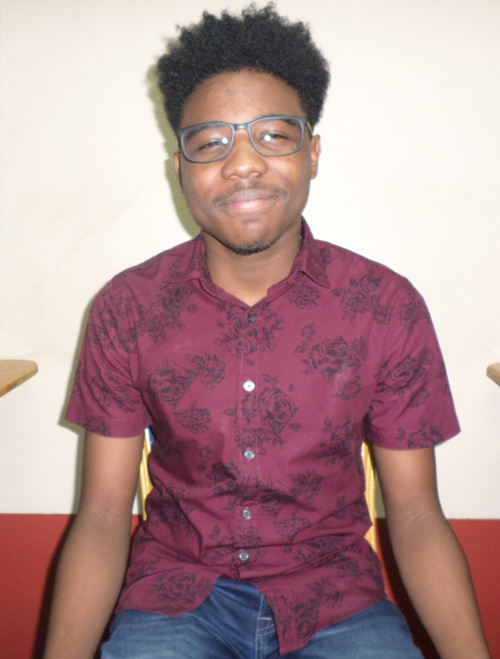 Christian, a student of the country’s premier educational institution – Queen’s College, was able to secure 19 grade one passes at this year’s sitting of the Caribbean Examinations Council [CXC]-administered CSEC examination. He will be able to stand proudly among other top national performers when the Ministry of Education announces the results today at a forum planned for the Kingston, Georgetown National Centre for Educational Resource Development [NCERD]. The subjects Christian wrote to achieve his grade one passes are: English Language, English Literature, Mathematics, Additional Mathematics, Chemistry, Biology, Physics, Integrated Science, History, Social Studies, Geography, Religious Education, Physical Education, Information Technology, Electronic Documentation Processing and Management, Principles of Business, Human and Social Biology, Spanish and Agriculture Science. But the top student, during an interview with this publication yesterday, shared that it was no easy task to write 19 subjects. “No exam was really easy; I took all of them as seriously as I could have,” related Christian, who however noted that there were some subjects that he was much better in than others. “There were some subjects that you know that you had to study harder, you really had to try that much harder to do them well,” said Christian, as he recalled Additional Mathematics being the most difficult of them all. “That was a huge leap up from general maths,” he disclosed, as he confided that undertaking the feat was in fact was a personal academic challenge. “It wasn’t about trying to out-do anybody. If I was trying to out-do anybody it would have been myself, because I was always trying to better myself all the time,” he shared. His goal to always do better was evidently not an overnight decision. But the intensity did increase by the time he was in Fourth Form. “It all started in Fourth Form,” said Christian, as he recalled having to direct a great deal of time and effort to completing his School Based Assessments, even as he dedicated time to extra-lessons and studies. “In Fourth Form I had morning lessons then I went to school; I had afternoon lessons then I went back home and my mother worked with me,” Christian recalled. But as part of challenging himself, Christian disclosed that while he opted to do 16 subjects in Fourth Form, by Fifth Form he’d added an additional three subjects. Moreover, he had to cut back a bit on his extra-curricular activities. “I really wanted to see if I could pull off 19 ones,” said Christian. He had no shortage of support. “I couldn’t do all this on my own, I have to thank my parents – my dad and my mom. My mom was there all the time with me; she had confidence in me even when I didn’t have that much confidence in myself. She would stay up late with me sometimes until two or three o’clock in the morning just so I am not alone studying. My dad, he provided all of the resources for me…all my books, anything I needed basically would be provided,” Christian revealed. At school, the teachers certainly played their part by “teaching me the new concepts and finishing their syllabi and I had very supportive classmates too…some of them would tell me, ‘you know you got this’,” a smiling Christian recalled. Even his teachers outside of school were particularly instrumental in his ultimate success. Although he is torn between astronomy and orthodontics, Christian is certainly well on his way to realising a fulfilling career. Even as he considers his ideal career path, the next step for Christian is to complete the Caribbean Advanced Proficiency Examination at QC. “These next two years in Sixth Form I’m actually going to focus harder about what I actually want to do in life, because I am not really sure as yet. So I will take these two years to focus and decide on what I really want to do and then I will decide on colleges,” said Christian, who is hopeful that he will be able to land a government scholarship. “We knew that he was going to be in the top-10 at least. I knew that and I confidently could have said that to anyone,” added Simpson-Pile who has been battling to control her emotions ever since learning of her son’s accomplishment. With Queen’s College [QC] claiming seven out of the 10 top spots, the results of the 2018 Caribbean Secondary Education Certificate [CSEC] examination was announced yesterday by Minister of Education, Ms. Nicolette Henry. Claiming the top spot this year is QC’s Christian Pile with 19 grade ones. With 18 Ones and 2 Twos, Shakira Bholo of the Anna Regina Secondary School was named the second best performer. 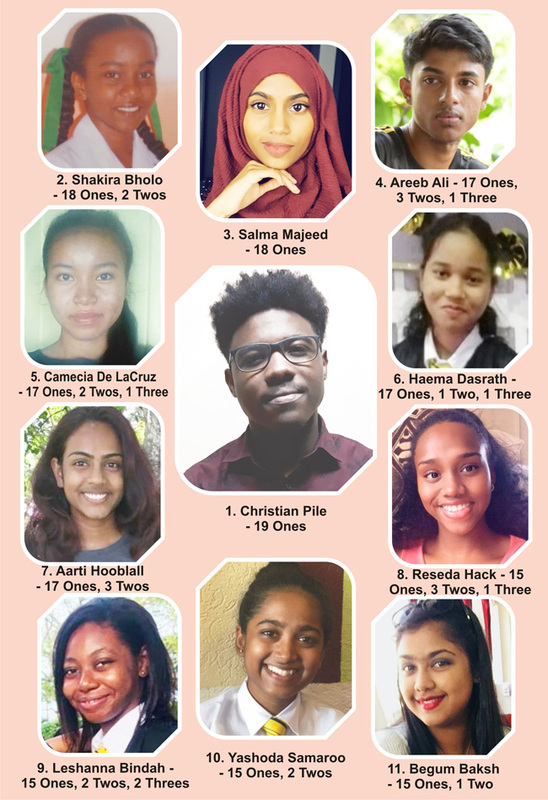 Following with 18 Grade Ones is Salma Majeed of ISA Islamic, while Areeb Ali of QC claimed the fourth best performing position with 17 Ones, 3 Twos and 1 Three. Congratulations to this amazing young boy. It makes me so proud to know that our youths are excelling in Guyana schools. I do wish you a very successful future in whatever field you choose. CONGRATS, CHRISTIAN! You are a shining star! Well done! Wish you well in the future. Best wishes also to the other students in their educational prowess.